"Fish bladder" redirects here. For swim bladder of a fish, see swim bladder. Mathematically, the vesica piscis is a special case of a lens, the shape formed by the intersection of two disks. 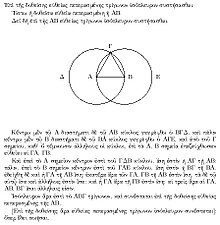 The area of the vesica piscis is formed by two equilateral triangles and four equal circular segments. In the drawing one triangle and one segment appear in blue. The two circles of the vesica piscis, or three circles forming in pairs three vesicae, are commonly used in Venn diagrams. Arcs of the same three circles can also be used to form the triquetra symbol, and the Reuleaux triangle. In Christian art, some aureolas are in the shape of a vertically oriented vesica piscis, and the seals of ecclesiastical organizations can be enclosed within a vertically oriented vesica piscis (instead of the more usual circular enclosure). Also, the icthys symbol incorporates the vesica piscis shape. Ecclesiastical heraldry of the Catholic Church appeared first in seals, nearly all vesica-shaped. The cover of the Chalice Well in Glastonbury (Somerset, United Kingdom) depicts a stylized version of the vesica piscis design (see picture). The vesica piscis has been used as a symbol within Freemasonry, most notably in the shapes of the collars worn by officiants of the Masonic rituals. It was also considered the proper shape for the enclosure of the seals of Masonic lodges. The vesica piscis is also used as proportioning system in architecture, in particular Gothic architecture. The system was illustrated in Cesare Cesariano's Vitruvius (1521), which he called "the rule of the German architects". The vesica piscis is a leitmotif of architect Carlo Scarpa and is used as a “viewing device” in Tomba Brion (Brion Cemetery) in San Vito d'Altivole, Italy. ^ Fletcher, Rachel (2004), "Musings on the Vesica Piscis", Nexus Network Journal, 6 (2): 95–110, doi:10.1007/s00004-004-0021-8 . ^ Heath, Sir Thomas L. (1956). The Thirteen Books of Euclid's Elements (2 ed.). New York: Dover Publications Inc. p. 241. ISBN 0486600904. ^ J. S. M. Ward, An Interpretation of Our Masonic Symbols, 1924, pp. 34–35. ^ Albert G. Mackey, Encyclopaedia of Freemasonry, 1921 ed., vol. 2, p. 827. ^ Shawn Eyer, The Vesica Piscis and Freemasonry. Retrieved on 2009-04-18. Wikimedia Commons has media related to Vesica piscis. Weisstein, Eric W. "Vesica Piscis". MathWorld.